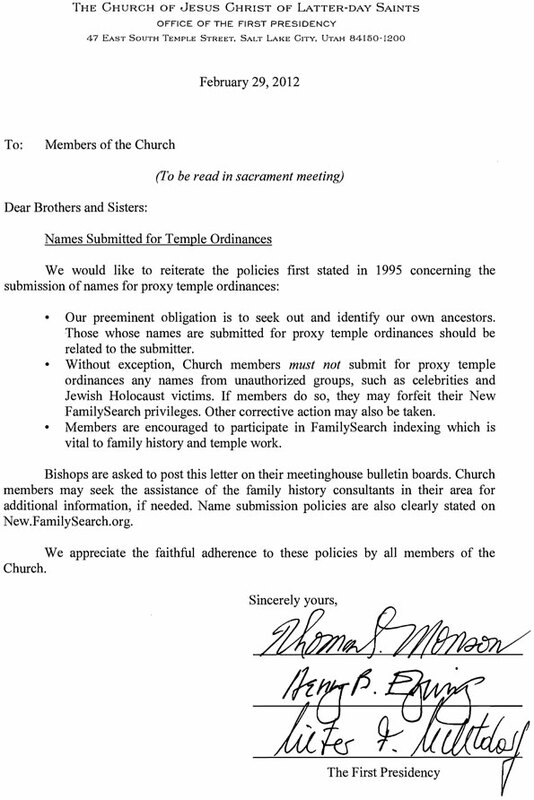 Recently, the First Presidency of the Church reiterated the policies, first stated in 1995, concerning the submitting of names for proxy temple ordinances. As both a user of the system (new.familysearch.org) where temple ordinances are cleared and submitted and as a leader in family history, you should help users follow these policies. You will find the policy letter below this e-mail. In a related Church News article, Brother Dennis C. Brimhall, managing director of the Family History Department, reported that “the searching out of our family and preparing the names for the work to be done in the temple is . . . a responsibility, but it is also a privilege. That privilege is extended to the members by those who hold the keys to [do] the work. The[se] keys . . . are held by the First Presidency of the Church” (Sarah Jane Weaver, “Family History—Church Asks Members to Understand Policies,” Church News, Mar. 1, 2012). (Click here to see the article.) The First Presidency set these policies. Accordingly, the Conditions of Use for users of new.familysearch.org and familysearch.org require compliance to the policies before you can submit names to the temple. As a family history consultant, family history center director, or staff member, many times you are the first person whom members go to for guidance and direction. It is imperative that you understand these policies and are able to articulate what they mean and that you teach compliance to them. Noncompliance could mean the loss of privileges to use new.familysearch.org. Over the next few months a series of e-mail communications will be sent to all registered users of new.familysearch.org reminding them of these policies.